“Biden is fond of quoting poets in public, usually Irish ones and often in the Mideast for some reason. But today the man who was a senator while Obama was in the sixth grade chose another nationality. As I said just before the president signed the healthcare bill, I quoted Virgil, the classic Greek poet, who once said, ‘The greatest wealth is health.’ The greatest wealth is health. 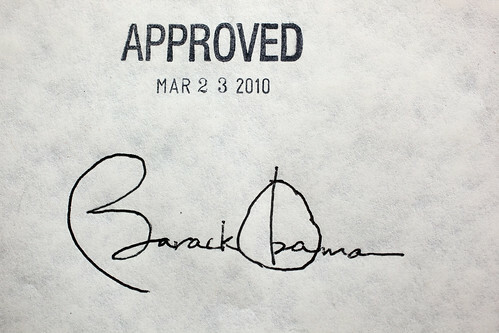 Mr. President, you’ve made us a nobler and wealthier nation by providing for the health of your fellow citizens. Virgil wasn’t Greek. He was Roman. Very Roman. So Roman, in fact, that the author (70 BC-19 BC) of the “Aeneid,” among other famous works, is buried in Naples. Andrew Malcolm is on a roll. A Mississippi man faces up to 20 years in federal prison after pleading guilty to growing hallucinogenic mushrooms. “At the Star of Texas Fair and Rodeo’s Swine Sprints, four little piglets rocket around a tiny NASCAR oval. They do it for the Oreo cookies waiting at the finish line, rooting them out like trans-fat truffles. It’s one of the things you can watch for free with your $7 fairgrounds admission, it’s in a shaded tent with bleacher seats, and your kids will lose their minds over how cute the beagle-sized porkers are. Candy apples and more, including “vintage chuck-wagoneers K.R. Wood and Karen Jellison from Manchaca” selling cane-sugar draft sodas in flavors from sarsaparilla to black cherry. Also, click these links for an update on Jim/Sean’s hurt knee and his new Biden nickname. I think it’s a keeper. The lawmakers will probably exempt themselves soon because government insurance, like rules, are for the little people. UPDATE: Ed at Hot Air says some staffers aren’t subject to the individual mandates to purchase insurance. Others suggest the issue is not mandates but the source(s) from which staffers can obtain coverage. I think the latter view is probably correct. This is reminiscent of Obama’s snub of Prime Minister Gordon Brown and the British media, a mistake that may have been intentional or due to diplomatic ignorance. My guess is Obama’s treatment of Netanyahu was intentional, perhaps because the White House is concerned Netanyahu would clean Obama’s rhetorical clock. ** The way things are going, “A New Era in U.S.-____ Relations” may become a series. “The murders of three people with ties to the U.S. consulate in Juárez were attacks by drug cartels against the U.S and Mexican governments, Secretary of State Hillary Rodham Clinton said today in Mexico City. She said drug cartels were responsible for the increased violence in the border region. The American victims were U.S. Consular employee Lesley A. Enriquez, who was pregnant, and her husband Arthur H. Redelfs, an El Paso County Jail detention officer. Their 7-month-old daughter is now an orphan. Also killed in a separate but simultaneous shooting was a Mexican man married to woman who works at the U.S. Consulate. He leaves behind 3 young children. How can we get D.C.’s public schoolchildren on his “choice” list? RSS and Other Technical Issues — Any Improvement? A tech guy whom I will tell you all about very soon has had a team working very hard on some technical improvements. For one thing, I am hoping that the RSS feed issue so many of you have written about is fixed. Also, we’re hoping for faster performance and less down time during a big link. Since there is no big link right now, let’s have some feedback on the other issues. Is the RSS problem fixed? Are your load times any shorter? Page loaded in: 0.2165 secs.